Step aside, Ms. Trelawney. Disney is the new fortune teller of the future. Didn’t they create “It’s a Small World,” the infamous ride where dolls sing about how small the world is, years ago? Their prediction came true. Now I can talk to all my friends—from someone living a couple of doors down from me to someone in the Philippines—with the power of one device: my phone. However, with every blessing comes a curse, and I didn’t realize the curse of constantly using social media as a means to talk to people until I decided to try out the #unplugUofT trend—where students try to ‘unplug’ from their devices and social media accounts for a little while—and met up with some friends not through a social media platform, for once. Where did I go? Well, I’m sure some of you know by now I have an intense obsession with tea. 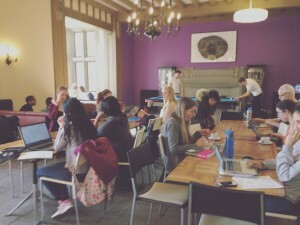 So of course I asked one of my friends to go to the Tea Social with me—a weekly event hosted at Hart House’s Reading Room every Tuesday. As promised by the title, there was glorious tea. Two big teapots filled with black tea, plus some granola bars set up on a side table. Tea – the ultimate form of temptation. I settled down on one of the upholstered leather couches with one of my close high school friends whom I hadn’t seen since our graduation last May. Even though we go to the same university, she is an Engineering student and I am a Humanities kid, so we haven’t had the same classes at all; consequently, I jumped at the chance to invite her out for tea when I realized we were both free today. When we entered the Reading Room, it was as if we’d entered another world. It had a warm atmosphere with dimly lit chandeliers and bright sunlight spilling through latticed windows. That, coupled with the murmurs of conversation and sound of sipped tea evoked a real sense of autumn fever in the air. If you want to look like you just stepped out of a 19th century novel, this is the ideal place to chat (aesthetically) and sip tea (aesthetically). There, my friend and I caught up with each other. We exchanged our woes about our hardest classes, sobbed about our first midterms experience, and chuckled about the funniest and weirdest moments we’d encountered in university thus far. After that, we sat and sipped our tea while soaking up the atmosphere around us. I, being a shamefully nosey person, let my eyes and ears wander around the room. In contrast to malls, where I often saw girls hanging out at the same table but immersed with their own devices, most of the people around us were sipping tea and conversing among one another, too. If not, they were quietly doing their homework. I heard the strangest and most interesting conversations float above the crowd, such as a couple of girls talking about the benefits of meditation, or some boys conversing about the latest movies they’d watched. My friend and I also watched a couple of people rock a game of pool on the pool table in the back—yes, believe it or not, there is a pool table. 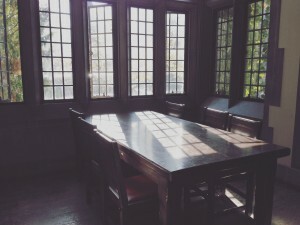 Chandeliers, wooden desks, and a pool table. What more is there to ask for? 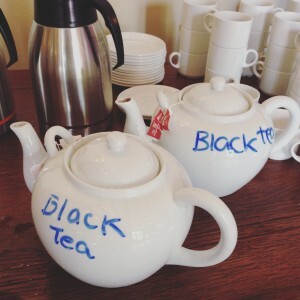 After the Tea Social ended and we parted ways, I realized two things: Firstly, the Tea Social is a great event because it revolves around face-to-face conversations with complimentary tea and snacks. Second, I missed my friend more than I realized and, after our meeting, felt like I’d really reconnected with her despite our ongoing texts. Yes, we texted each other a lot, but it was different chatting with her in person. While our texts had some moments of hilarity, our convos yielded to way more unexpected stomach-clutching laughter. I mean, I got to see my friend’s face instinctively morph into the I’m-in-pain-but-still-smiling emoji. Really, my friend I simply enjoyed each other’s company, no electronics or urge to use electronics involved, with the warm light outside, and, of course, the warm tea—and it was great. Are there any events you go to or anything you do to unplug? 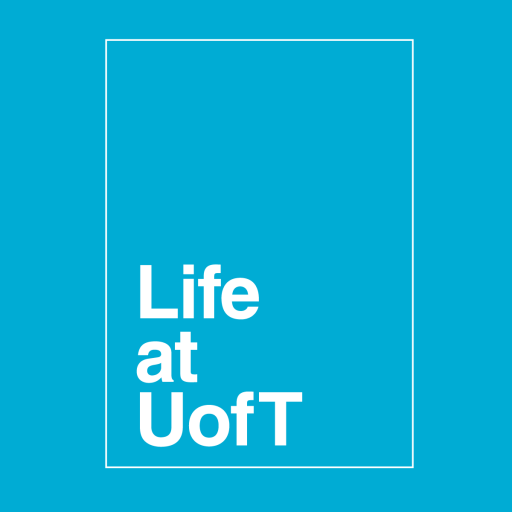 Let me know in the comments below or through Twitter @lifeatuoft!